What if we applied the best practices and mindsets of community-building to schools, instead of those of organizational design? What might happen? Anyone who’s been a teacher knows how easily school cultures shift to us/them mentalities: teachers / administration, administration / student, school / family…the list goes on. We talk about the different communities that comprise a school, and we talk about school as one community - but we don’t always design for it. We get so caught up in the daily machinations of the school, the structural remits, the regulations…and that means that we sometimes forget that we are trying to build a sustainable, thriving community. 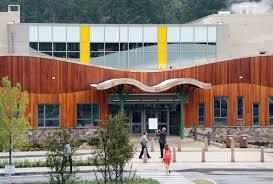 The most recent example I can think of is the redesign of Sandy Hook elementary school, a space created to meet the needs - academic, emotional, and safety-based - of a unified and passionate community. From the soft curves added to create a feeling of whimsy and joy, to the layout that ensures classroom spaces are visible from multiple vantage points, this is an example of a school being built to harness the existing community, and create a sense of pride in a communal space that was otherwise reminiscent of trauma.